The last stop on Marcus and I's holiday in February was Kagoshima! As with Nagasaki, we didn't have too long there, but we managed to visit Sakurajima, the volcano in the bay opposite Kagoshima city. I used Bleach London's Rosé to dye it again. I have mixed feelings about it to be honest, and I only use it under very specific circumstances: when I'm not sure how long I want to stay pink for and want to be able to return to blonde or silver easily. Why? Because, as I mentioned last time, it fades really fast. Also, compared to my usual mix of Directions 'Carnation pink' and conditioner, it doesn't leave my hair feeling that nice. It also didn't cover my yellowish roots as well. I went back after a few washes and redid the roots with diluted Carnation pink. That being said, I still use it if I want to be pink for a week or so but don't want to commit to it. I also love the colour! Especially if it's one wash in. Rosé also has the advantage of being already pastel, whereas in the past (way back) I've put the Carnation pink on and it became this highlighter pink colour (that incidentally really didn't fit my style) that wouldn't disappear for weeks (even when it was time to go back to school, whoops). Rosé is also way easier to get hold of, just go to your local boots or superdrug. Directions is available online or in 'alternative' shops, or hair salon supply shops. The verdict: Which is better? We really didn't have long in Nagasaki, so I thought I'd write a quick post on how we made the most of our day there. If you thought Kyary couldn't get any weirder after Pamyu Pamyu Revolution, you thought wrong. I mean this in a good way though, because I adore Kyary. This album really takes me back to a few years ago when the singles were being released. Even though I'm super late, I'm glad I bought it eventually. I love Kyary, she's one of my fashion inspirations, and her music is so fun to listen to. She's also a Karaoke staple amongst my friends. The title is a pun on the phrase Nanda kore? ("What is this?") Which pretty nicely sums up my feelings for some of the songs on this album. I love it, and I can't stop listening to it, but there comes a point when you're doing homework at 2am (whoops) and listening to "mi" and you start to question your life. The album is a decent length, with 12 songs on it. The album's intro track is called Nanda Collection, same as the album. It sounds like the music at a theme park, and makes me excited, Good use of Kazoos. A big part of the album is catchy single tracks, like the Halloween single Fashion monster. Also Ninja Re Bang Bang, Invader Invader and Furisodeshon. Another part of the album is the crazier tracks: Mi, Noriko to Norio, and Kura Kura. Mi, is completely inane. Really. The chorus doesn't really have any lyrics apart from "mi" over and over again, and it is super catchy, and also a little hypnotic. I love it so much. Doesn't stop it from slightly driving one crazy though. try and explain to someone that this is music. Go on. Kurakura is another of the slightly crazier ones, but it's still really fun to listen to. The lyrics in the bridge are just like "chu chu kura kura chu chu kura kura". Who says songs have to make sense anyway. Kura kura means dizzy by the way. Noriko to Norio is also totally mesmerising. Cuter tracks like Otona na Kodomo and Kimi ni Hyaku Percent. The lyrics for these were so cute! Kimi ni Hyaku Percent is all about how you shoud tell people your real feelings and try your best and stuff. I love Super scooter happy too! It's so happy and cute, and the melody is so catchy. It's quite relaxing too. Saigo no ice cream is really pleasing, and the 8-bit style melody just kind of washes over you. I think in the chorus they have remixed the melody from the mini games in the princess peach DS game.... Does anyone remember that game? Fusisodeshon was about turning 20, (Hatachi means 20 years old) so I've been listening to it a bit more now I'm 20. Lastly, Otona na Kodomo is such a nice way to finish off the album, it's a bit more low key and relaxed than the rest of the album, so you can slowly adjust back to normality from songs like "mi". I love the lyrics to it too. After we left Hiroshima, Marcus and I went to Nagasaki, Kyushu. We got there by shinkansen, and then the 'Kamome' special express train. Expensive, but so fast! After we got to our hotel, we decided to go into Nagasaki and check out Inasayama, as the view of Nagasaki is supposed to be amazing. It didn't disappoint! Nagasaki is a long, thin city in a valley, and all the lights make it look like the milky way. So, I'm in Japan, I have bleached hair and I forgot to pack my trusty silver shampoo from home, what's a girl to do? I decided to try and make my own, and I'm surprisingly pleased with it! Bleach London's silver shampoo, which is more expensive but lasts for ever. It's more pigmented, so you need less, but it has stained my hands a couple of times. Here in Japan though, you can't find silver shampoo or white toner so easily. So what's my solution? Add some dark purple hair dye to your regular shampoo. It's quite simple, really: get a lot of shampoo in a bowl, add a small bit of hair dye, and mix it up. The more hair dye you put in, the more silver-ish you'll end up. So if you just want to use it on blond hair to get it less brassy, add only a really tiny amount of hair dye. You can also use this method with your conditioner or hair mask, as long as it's a white colour. One warning though! Purple hair dye undiluted can leave a stain, sometimes even a green stain to your hair! So make sure to dilute it A LOT when it's in silver shampoo, unless you want your hair to go actually purple. Start with a small amount of purple, and you can always add more later. Sort of like when you're doing pastel hair dye. Another point is to not leave it on for too long, just use it like a normal shampoo. There's a lot more to Hiroshima than what we learn about in history class. Although of course remembering and respecting the past, Hiroshima is a lively fun city full of good food. A short way away is the hugely impressive Miyajima, famous for the floating Torii at Itsukushima shrine, and also the less well known Iwakuni. Onomichi and the Shimanami Kaido are also close by. So, it's spring, and I got to see all the Sakura! It was so beautiful! I'm not going to get round to doing proper posts about everywhere I went for a while. But, my Instagram (@candyflossoverkill) is up to date, and lately it's been full of gorgeous sakura. I've always been a leetle skeptical of the "Sakura hype train" way before Sakura season, Starbucks started putting out their Sakura line, and all the adverts become Sakura themed. But then all the sakura bloomed, and I totally understand what all the fuss is about, oh gosh. There are so many Sakura trees in Japan, it's a really noticeable difference! Sakura everywhere, and everywhere looks gorgeous. I was so worried about whether I'd be able to get any decent pictures, but luckily I did, so it was ok. When Marcus and I visited Hiroshima, we stayed in an Airbnb in Kanayamacho. Kanayamacho is a pretty lively area, full of restaurants, and also host clubs and massage parlours... Marcus said it reminded him a little of Kabukicho in Tokyo, but I guess that's because it's near the 'entertainment' area. The apartment itself was really nice! It was pricier than some of the other ones I've been to, but it was still reasonable. It was really spacious, had a tatami room and even had a washing machine. Basically, it was perfect. Our host was also really friendly and helpful. Check out the listing on airbnb for more information. Here are a couple of pictures of the apartment and Kanayamacho. Thanks for reading! Once again, I'd really recommend airbnb if you're travelling on a budget. Just make sure you check it has lots of positive reviews and is in a convenient location. While Marcus and I were in Hiroshima, we went on a day trip to Iwakuni and Kintaikyo. Iwakuni was one of my favourite days in Japan so far, actually. It's a little off the beaten path, but if you're staying in Hiroshima it's well worth the trip. We went to see Kintaikyo- an old, famous bridge that is built in five arches. Iwakuni castle is also well worth the visit- although it is perched on the top of a pretty large hill, there's a cable car that takes you up most of the way. Visit Kintaikyo for some awesome architecture, and a relaxed day of sightseeing. Today marks exactly seven months since I came to Japan. My time here is quickly running out and it's a little depressing, but I want to enjoy the last few months as much as possible. So anyway, here's a quick rundown of last month. A couple of my blog posts went completely crazy! (For my standards, anyway) Recently I've been trying to improve the standard of my blog, which is why I bought the new design from pipdig. I've also been trying harder with the imagery and content. Anyway, it was awesome to have so many pageviews. I'm just writing this for fun, and of course it was nothing compared to other people. but I was happy that people read my blog. The blog posts in question were: a post about my new DSLR, (the Nikon D3300) and a Japanese fashion haul post I did a while back. I've been pretty inspired with CandyflossOverkill recently too, even if the daily schedule has slipped a bit. I guess it's true that if you have a lot going on in real life, you'll have a lot to blog about. My family came to stay! We stayed in Kyoto and saw the sakura together, and it was awesome! I have a few posts lined up about that, along with a few tips on 'tourguiding' others who don't speak Japanese or know much about Japan. I found out my results from the Autumn term (I don't talk about grades a lot on here, but getting good grades is super important to me) and they were really good! I tried really hard last term so I'm happy. The only thing is, now I've been moved up into 'advanced' Japanese and I feel like a fraud because I've only been studying for a year and a half. I went to see SuG omg <3 I'll do a whole other post on it some time, but let's just say that this little fangirl will die happy. So with the last couple of months here, I want to carry on working hard, try and tick a few more things off my bucket list and pass the JLPT N2- wish me luck! Hopefully when I've picked all my courses and got into a routine, I can post more too, stay tuned! If you're in Japan, Miyajima is a must do in my opinion. The island is actually called Itsukushima, but is usually called Miyajima (宮島)which literally means 'shrine island'. Miyajima is famous for Itsukushima shrine, and the Torii gate that appears to float in the water outside the shrine. The Torii at Itsukushima is one of Japan's 'three scenic views' (日本三景) along with Amanohashidate in Kyoto Prefecture and Matsushima bay near Sendai. It's one of my secret goals to have them all ticked off by the end of my year here. There's also a more expensive ferry that goes from near the Genbaku dome in Hiroshima. To get to the cheap ferry, take the tram to Miyajimaguchi (or the JR Sanyo line) and then there is a choice of two ferries that will take you there: a JR ferry and another ferry, but both are 180 yen each way. The ferry ride is really nice! I really enjoy ferry rides anyway, so maybe I'm biased, but it was really quick and you could see the Hiroshima area and also the first glimpse of the Torii of Itsukushima shrine. When you get off, you can walk through the cute and touristy town area to the shrine, and the beach! Miyajima is also famous for its deer. The deer really are friendlier than those at Nara. And by friendlier, I mean they leave you alone more. You aren't allowed to feed the ones at Miyajima, which is probably a big part of the reason. The deer at Nara can get really invasive and a little scary, especially if you are holding food, in which case they'll come right in your face and bite your clothes. If you buy the deer biscuits to feed them, usually about four deer will all rush up to you... The deer at Miyajima were great in comparison. But they are still wild animals, so still be sensible. When we got to Miyajima, we decided to go in Itsukushima shrine (entry is 300 yen) and had a look round, then got some food from a really nice restaurant in the area. I got a set meal with the area's specialities- kaki (oysters) and anago (a type of eel) and it was so tasty! Especially the eel! After that, we walked on the beach up to the famous torii- low tide is around midday, and you can walk out and touch it, or take a selfie with it. The torii is way bigger than you think, and really impressive. Then we decided to use the ropeway which goes to the top of the mountain, but unfortunately it was closed! The one week of the year it was closed... So, Marcus and I decided to hike up to the top of the mountain. It was a couple of kilometres, so a fair walk. Well worth it though: the view was gorgeous. The inland sea is one of my favourite areas of Japan, and it's so scenic. Apparently on a clear day, you can see Shikoku too. Also, don't people always seem to be friendly when you're hiking? There were a few shrines and temples along the walk. More disconcertingly there were quite a few warning signs about poisonous snakes, called mamushi, as well! I didn't see any, luckily. It was such a good day at Miyajima, and I'd go there again in a heartbeat! Marcus and I went travelling a little over the long spring holiday, and the first place we went to was Hiroshima. I had such a great time there! It's a really fun town, with a really nice vibe. My first impression of Hiroshima was, "It really is wide though" (the city's name mean's 'wide island' 広島). It's got loads of rivers running through it, and the roads are big and wide in the city centre. They also had trams! For some reason this instantly impressed me. We didn't have long in Hiroshima itself, as we went on day trips to Miyajima and Iwakuni (which I'll be posting about soon enough), but for our day in Hiroshima, as well as going to the Genbaku dome, we managed to have some time just to chill in town for a bit. We went shopping, had a really tasty crepe, and there was even a Lush- Hiroshima is really nice for shopping. I'm thinking of doing a big 'spring Jfashion haul' post soon, so stay tuned for that. So I'm pretty sure it's still the Easter holidays over in the UK, but here in Japan the new term has just started. It's like another clean slate, and if you wanna do well this term, might as well start as you mean to go on, right? Because who doesn't love stationery? 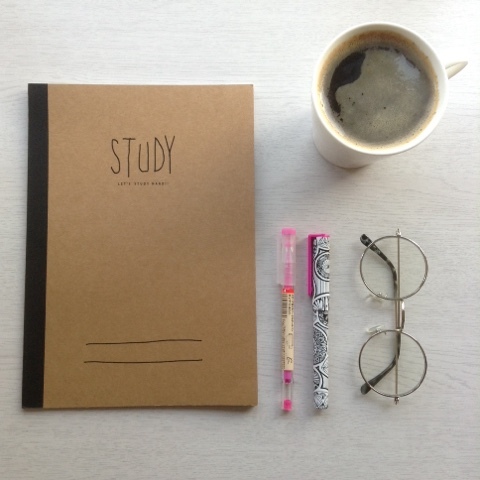 It doesn't have to be expensive (the notebook above is from Daiso, the Japanese equivalent of the pound shop) but something as small as a new notebook can actually make you feel motivated. Or just use the one on your phone. Either way, write down all of your deadlines and revision schedule, etc. Just do it. It sounds boring, and it may well be, but make a revision plan and look at the syllabus to see when your exams and essays will be. Exam revision is so much easier when you're not cramming. So you know what's going on, and you can look smart if the lecturer picks on you for a question. I actually wrote a post on basic self care not so long ago, and this is especially important for students. Eat well, drink water, sleep enough and get some exercise. Aim for around 8 hours. I know this isn't always feasible as a student, but lack of sleep can really affect you and it's so easy for sleep to spiral out of control. Try and get a regular sleep schedule on weekdays (or on days when you're not going out) at least. I usually have a day when I'll tidy my room, hoover and do a load of washing once a week. This will help you keep everything in check, and maybe you'll avoid the student cliché of having to buy new underwear because you have no clean ones left. (Although I'm pretty sure we've all been there at some point). I mean some lecturers set mountains to read, but there's nothing worse than turning up to a seminar and not having a clue what you're supposed to be discussing. 10// Do some crazy things! You're only a student once after all. Travel, go to gigs, dye your hair weird colours, start a band. Do all the things. Even if it's only a fiver a week, it will soon add up and you can treat yourself to the aforementioned crazy things. 12// If you're not in a club already, join one! It's good to make some friends outside of your course. This could save you so much money! Cooking your own food can work out way cheaper and healthier. The same goes for coffee (get a flask) and bottled water. 14// Make sure to reward yourself for your hard work! I also wrote a post on 13 little ways to treat yourself , even simple things can give you a boost so don't go thinking you need to drop a tonne of cash. Thanks for reading, hope this was helpful! Good luck to any of you students! Ok, I super need to start taking outfits with my DSLR, the quality of these photos is not great, sorry. How to talk about blogging IRL?